A dark brown leather set with selected yellowish white amber. An amber necklace, bracelet and ring braided with hand-made leather laces. 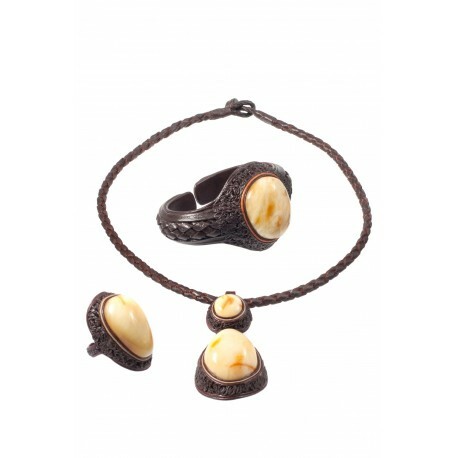 Unique and individual design, handicraft leather jewelry set decorated with amber. Inspired by the friendship of leather and amber, an artist created a real art masterpiece. The original jewelry sparkling with harmony of leather and amber, which you will not only wish to look at but to wear, as well. The art work shining with charm, secret and subtlety.